As part of the long-lasting cooperation between the INSA Strasbourg and Syracuse University, New York, the team of the international office is happy to welcome Ryan Jolley as intern for six weeks from May 22nd until the end of June. During her internship, she will update the English version of institutional presentations of INSA Strasbourg and revise the English version of the welcome guide. For all those who organize guided visits of INSA Strasbourg within the framework of a welcome program for English speaking delegations, she will also write practical guidelines with useful expressions and translations into English. In addition, Ryan will translate as well as correct the articles on the international RI blog and she will be glad to give some general linguistic support adapted to the needs of the International Office team. 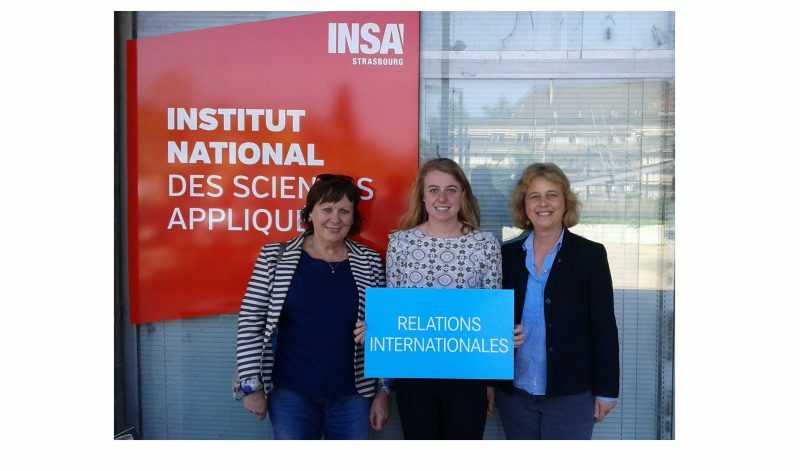 We wish Ryan a pleasant stay at INSA Strasbourg and we are sure that she will do a great job with the international relation team. From left to right: Mick Hardenberg, internship and housing coordinatior; Ryan Jolley; Angelika Hammann, director of the international relation office. Partager la publication "Welcome to Ryan Jolley- Syracuse University"